You may have difficulty in business and more importantly your personal life if no one really ever believes that you’re credible, then taking the slant towards not liking you that much as a result. Your degree of success in life, your work and layers of relationships are generally directly proportionate to how quickly and how well that you’re able to establish credibility with those around you, to be trustworthy, being reliable with your customers, investors, and relatives. There are steps as directed by professional development consultants on how you can come across as more believable and likeable, ways to make certain that your demeanor isn’t in question. The most important is coming across as genuine as possible, being the real you, being honest and vulnerable without showing a shadow of smugness. Gone are the days that you would gain instant credibility with whomever you came in contact with, just because of the clothes you wore, the car you drove, the product you represented, or that fancy job title. People will now respect you for who you are, the individual person regardless of your rank, and not the shield that you hide behind, they don’t care who you claim to be, perhaps that phoney facade leaking through. The very moment that you pretend to be someone who you’re not, or exaggerate to be more than who you really are, flexing your shallow ego, your credibility will become instantly suspect. So be as authentic and transparent as possible, don’t be afraid or ashamed to show your warts and faults, even if all you have to offer is your enthusiasm. The instance that you decide to add your genuine insight into a conversation that you’re having, what that automatically develops is your credibility. Having this insight comes from doing research on the company that your meeting, or that person you’re seeing for the first time. So know the important role that they play in their particular industry, or the profiles of the customers that they serve. Once you provide this type of extended insight, it’s then strengthened once you begin developing new contacts along with different perspectives within their firm. Keep in mind that even the most brilliant of CEO’s don’t know everything, and since your looking at them from the outside in, you may be able to offer a completely new perspective for them. The instance that you begin sounding like a salesman, your customers will then immediately pigeonhole you as another “taking head,” and will begin to mentally tune you out. So when you do meet someone for the very first time, avoid saying anything which may sound like a “canned” sales pitch, and never come across like your attempting to sell them something. Don’t bother making unsubstantiated claims such as, “We offer the highest quality in the industry,” and avoid using any market or industry slang. Instead, clearly describe something as you would to a friend, on what you happen to be offering, which will improve their business or personal life. Once you realize what the true value of the products or services that you’re offering is, you’ll then be able to offer both the strengths as well as the limitations of your goods. You then won’t fall into the trap of giving into unreasonable customer demands. You’ll instead stick to your company’s procedures and policies, while concisely explaining to your customer why it makes sense to them. You’ll come across as being more confident, which creates more credibility. Those who are considered credible never need to prove who they are every time. For instance, nothing projects the “I’m insincere or insecure,” persona when you begin rattling off answers or issues to questions which haven’t even been asked yet. Always wait until they speak first, whether it be a customer, friend, or a new relationship, and then make sure that you listen as intently as possible by sensing their tone. Also take a few moments to consider what they said, and then reply or make a remark, or offer feedback in full introspect. Ask another question if you need to, or tell a related story just to move the conversation forward. Whenever you watch a movie, the hero of the flick will suddenly swoop in just in the nick of time, to save the day or the damsel. But in real life, that well intended “hero” would most likely fall flat on their face. 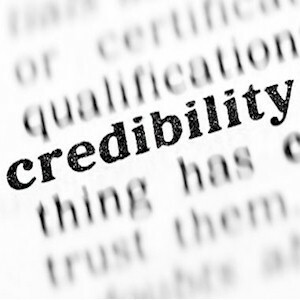 Credibility is often derived not from your hero based actions, but from you being able to crystallize or solve problems or issues and come up with the right solutions. Even those customers or relationships who may have a detailed list of requirements or issues, they usually need a better more clearer understanding of what their needs are, and what the best solution is to meet or fix them. What doing so does is it helps the customer, so they could be the hero themselves, which will create an abundance of credibility towards you.